For years, industry people have hoped for the demise of NTSC and PAL analog cameras. Now that day has come and, after years of steady declines, the end has come suddenly. But the killer is a surprise. Though IP has been dominant for years in the high end of the market (larger projects and richer countries), IP has never been able to eliminate analog usage for small projects and less wealthy countries. IP's cost premium and additional complexity continued to hinder its expansion in those areas. Analog was killed by... analog. In less than 3 years, HD Analog (like HD-CVI, HD-TVI and AHD) has gone from nothing to killing SD analog (i.e., NTSC / PAL and even 960H). In 2015, SD analog sales will fall more than 50% compared to 2014, a massive drop. And SD's decline has accelerated throughout 2015, as HD analog offerings have ramped up and more suppliers switch away from SD / 960H to HD analog. HD analog offers MP at roughly the same price point and with the same cabling as SD analog. Just like MP was the 'killer app' that drove the high end to IP, MP was the driver for moving the lower end of the market from SD analog to HD analog. 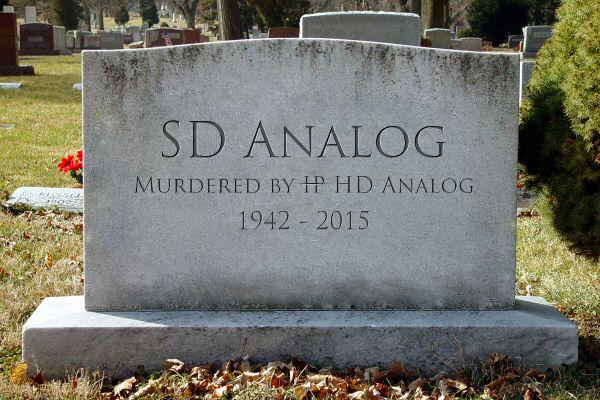 2015 was simply the year that HD analog went mainstream, and in doing so, it knocked out SD analog. Just like some CCTV VHS machines are still recording in 2015, despite being killed a decade ago, some SD analog will continue for years to come, though only in 'maintenance mode'. At the low end, where individual kits are bought, we see SD analog quickly becoming extinct.  However, at the mid to high end, where systems are maintained and gradually expanding for a decade or more, some SD analog cameras will continue to be sold, simply to replace broken SD cameras or add small numbers on to SD analog systems that are not ready for complete replacement. As HD analog matures, we see even SD analog systems adding them even before migrating to HD recording. Increasingly, HD analog cameras are including the option of dual HD and SD analog outputs which would help facilitate this migration (i.e., buy an HD analog camera now to replace a failed SD one, record it SD in the short term and when ready to upgrade to HD recording, 'flip' the camera to the HD output). With the death of SD analog (finally), now sets up a new rivalry - IP vs HD analog. As our HD Analog Usage and Rejection Statistics show, HD analog is taking share both from SD analog and IP. However, since HD analog has started from the bottom of the market, it has had far more of an impact on SD analog. The bigger question becomes, how competitive can HD analog become against IP? As our HD Analog vs IP Guide 2015 shows, today, though HD analog wins (big) on price and simplicity, it loses on many other elements - max resolution, advanced capabilities, breadth of vendor support, VMS integration, brand recognition, etc. which makes it unattractive to most on the mid to high end. However, it is quite possible, though not guaranteed, that HD analog closes the gap on most of these in the next few years. Given the potential / need for HD analog improvements, we believe it is hard to predict the actual outcome. On the other hand, those who simply dismiss HD analog because it is analog, and that analog is dead, are imprudent. And Todd Rockoff stands vindicated, although not exactly how he thought he would be. Non-IP HD is a reality, just not the HD-SDI (aka HDcctv 1.0) he pushed for years. Though not that far from where he began either. Sure, he went Digital instead of Analogue, but that's all he had to work with. Maybe if instead of launching LinkedIn flame wars he might have discovered The Real Inventor Of HD-CVI And HD-TVI. But 95% of his arguments for SDI apply equally to CVI. 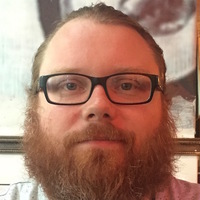 "But 95% of his arguments for SDI apply equally to CVI." Except for the one about cost. We used to have arguments about this in the 2010 - 2011 era, where our position was that the price of SDI / HDcctv was simply too high. It took the HD analog providers in the past 2 years to offer the rock bottom prices that Rockoff had hoped for. But Analog still wins in low light all day!!!!! Sure, the image quality looks like an Atari game but its still better than any IP camera out there, take that and pair it with a tube monitor and you got yourself a mean surveillance system............... Totally kidding. Sean, that's funny because it was a common complaint even up to a few years (recall the Axis SD Q1602, e.g.). I am sure there are still some people who stick to that. However, it's amazing how much sensors have improved that the top non-thermal, non-IR cameras are now 1080p (including from companies like Dahua and Hikvision - see: Hikvision Darkfighter Camera Tested and Dahua Starlight 1/2" Camera Tested). As 'hackability' becomes more and more of a concern a return to a true closed circuit of devices with only one or two networkable points that need securing will be become prevelent. Also as the developing world scrambles to 'monitor' itself in higher resolution price will be king. David, interesting point! If cybersecurity continues to rise as a concern for video surveillance systems, HD analog cameras (even using baluns and category cable) could become a useful technique to reduce exposure. ...return to a true closed circuit of devices with only one or two networkable points that need securing will be become prevelent. Disagree. The "true" closed circuit of yesteryear had 0 networkable points, not 1 or 2. 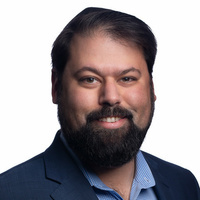 More importantly, although networks with less devices are nominally more secure, the weakest point is, and will remain the DVR/NVR, as it cannot totally isolated from the outside world in the way that cameras can be. "The "true" closed circuit of yesteryear had 0 networkable points, not 1 or 2." What year was that? 1999? :) It's been a long time since CCTV had 0 networkable ports? Agreed. That is why a 'return to a true closed circuit' is implausible. If this were true we'd still see parallel ports on printers, instead of Ethernet/wifi as the default connection method. The security industry at-large still hasn't learned IT security, but that will change. At a minimum hooking up IP cameras to a PoE NVR device (Razberri, et al) effectively eliminates your attack point to a single platform, just like an HD analog NVR. 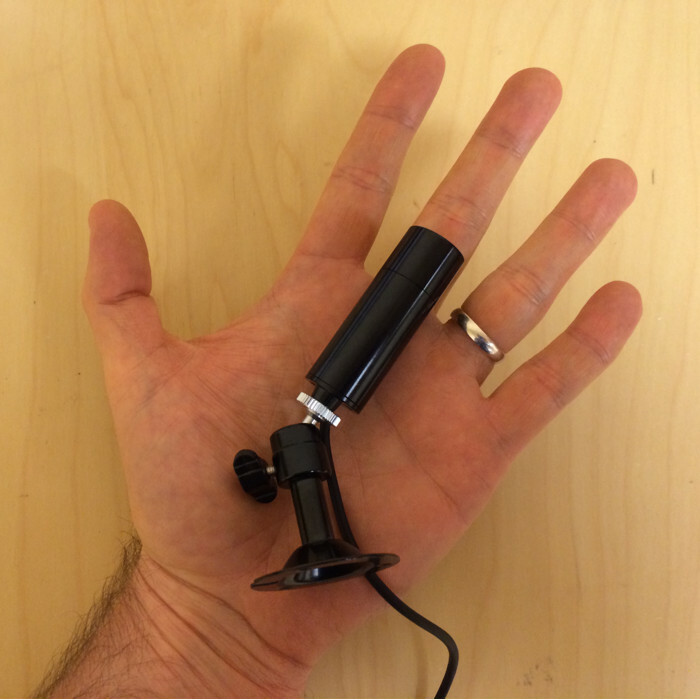 Still waiting for HD analog/TVI/CVI encoders so we can start using this for enterprise deployments. Hikvision has an 8 channel and a 16 channel TVI encoder coming out. It's not on their website but I saw it in their fall 2015 catalog. Ari, thanks for sharing. Hikvision has mentioned they are coming but no firm NA release date. Hikvision USA will have stock before the end of November. For me, new installs are all about IP. Even if its a budget install. Upgrades of existing systems it's all about TVI. I cant see installing TVI as a new system. Our technicians who used to be against installing IP, no prefer it and can install it faster. It's worth spending a few dollars more for IP. No need for an external power supply on small projects or messy cable in someones office. 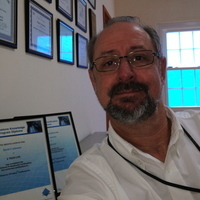 John, thanks, how does the pricing compare for you on TVI vs IP (say with Hikvision)? Is it really just a few dollars total price difference? If we're installing 720P cameras theres only a $40 price difference per camera, but than you have to consider the cost of a good quality power supply, so it about evens out. Most of the low end TVI cameras aren’t built as well either, so thats a concern for me. I am in the North East, I need to be sure the cameras we install can holdup to the storms. When you add in the additional time of installing the power supply and cleaning up all the cable. It’s almost the same cost. As someone that spent many years working on analog mobile, wireless and body worn products, I saw a large customer demand for those items but only very limited interest from vendors on them. I'm curious to see what will happen to those areas if analog truly 'dies'. Mobile IP cameras have been attempted but not very well adopted (for various reasons) but I wonder if any vendors will expend energy on an HD analog mobile dvr. That would solve the major issues with mobile IP, namely how to get 48v POE from a 12v source, and how to harden a mobile NVR with enough processing power for IP cameras in a vehicular environment.... and not break the bank. "I wonder if any vendors will expend energy on an HD analog mobile dvr." 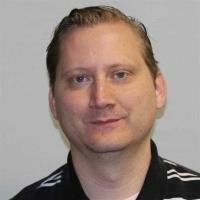 Scott, give how well HD analog is selling, and the value of using analog in mobile / bus applications, I would expect to see that in the next year or two. That's a good example of a main limitation of HD analog right now, as it does not yet have more niche form factors / options. Hikvision is coming out with them. I just ordered some units to start an internal test. There are many advantages to the "new" HD over Coax that are significant enough to overcome the issues with version 1.0. One single separator other than price is the distances. Parking structures are a prime example where they need better images and that extra 700' or so makes a world of difference. Version 1.0 didn't help with this. Some of the cameras HAVE some pretty advanced imagers as shown in IPVM tests. It's not all "the lowest cost" when you buy a HD Coax camera with true WDR and Remote Zoom/AutoFocus capabilities. I see this technology as another tool in the belt to be used when needed, and there is a need. As small businesses have to deal with PCI compliance there will be value in not stringing network access points around the building. There are many in this group that make efforts to prevent issues but this is a limited subset of what is out there. When encoders are common place it will increase adoption IMHO. the problem with analog HD is that each manufacturer has its own format. When using IP, you have ONVIF as an alternative to integrating multiple manufacturer's cameras. There is no such standard for analog HD. The 3 way fight (CVI, TVI, AHD) is a drawback, especially for those with larger systems that need to ensure expansion and replacement devices are available for years to come. We are starting to see some recorders support both TVI and AHD but Dahua (CVI) seems determined to go it alone. There are some cameras out there that claim to work with all 3 but they can have image quality problems and are unauthoried by any of the 3 providers (see: HD Analog Four Way Cameras Tested). Authorized recorders that support both AHD and TVI? Thats huge! Are they OEM or real HIK/SAM product? Digital Watchdog, for example, mentioned this to us. We have heard other people in that space talk about it as well, so I am pretty sure this is going to be more prevalent in 2016. Yes, it is a problem that there are so many HD Coax formats. Just like it was a problem with so many PTZ control formats and UTP formats like PELCO C and its competitors. Fortunately on the IP side ONVIF came in and made everything IP work perfectly together just like plain old NTSC and PAL (which has also plagued the industry). Three or four formats aren't going to slow the flow as much as a 300' distance limit and expensive cameras did to version 1.0 SDI. Interesting solution, notably for low latency systems. Are PCI/PCI-Express capture boards planned or available for these HD analogs "standards" ? Sylvain, we have not seen any, so some might exist, but it appears to be uncommon right now. Related, there remains limited support on the DVR side. We expect this to change though, given that many manufacturers tend to be conservative, waiting for verifiable market shifts before adding in support for new protocols/ standards/ transmission types. That said, 2015 HD analog results will show quite conclusively that this is a big market. Sylvain and John, Exar (fomerly Stretch) is now sampling HDCVI PCI-Express capture and compression cards. Colin, do you expect those cards to be sold individually or only embedded into DVRs? Yes, our SD and 960H cards go individually through VARs and Systems Integrators as well as OEMs building DVRs or hybrids. We expect the same for HDCVI. Something interesting about this is the adoption rate. When did CVI / TVI / HD Analog hit the market- 2014? 2013? While it is not exactly dominating the industry it has made a bigger splash in a shorter time than IP did. Austin, yes, good point. None of the variants really started becoming available until 2014, which underscores how well it has done this quickly. In terms of its short term splash, HD analog has shot up very quickly. However, if you put it into the context of 'non IP HD', it has taken a long time. The first non IP HD effort was launched in 2009 and it went nowhere for years. And then in 2014, as they switched from non IP digital to non IP anlog, it exploded. You can get those in TVI actually. 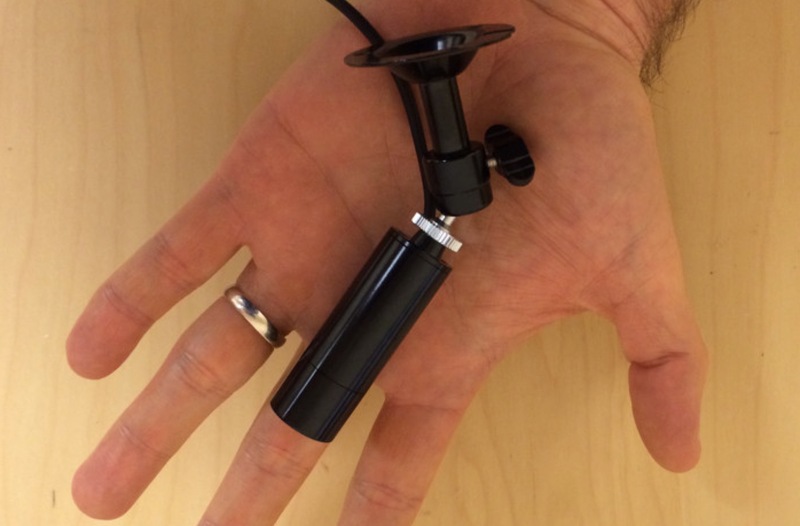 Does someone know if there are AHD pinhole cameras? Carlos, Alibaba shows some AHD pinhole cameras. The problem with AHD, in general, is that there are very few major manufacturers with significant product / form factors available right now. 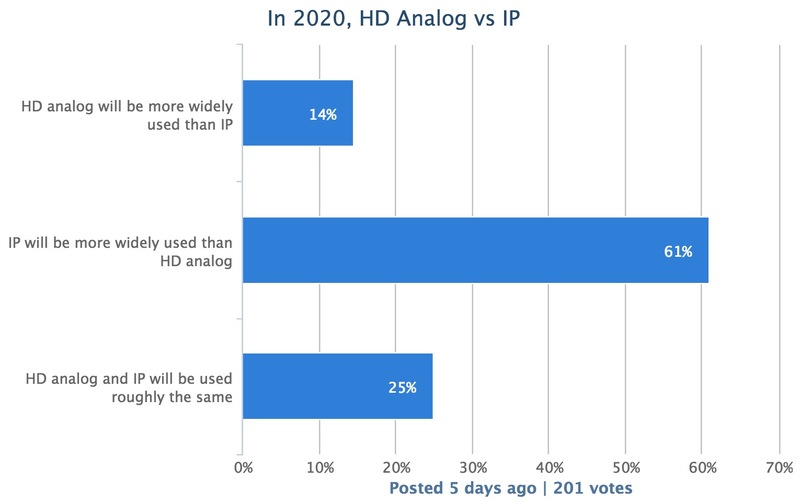 With over 200 votes, IP won the poll with 61% choosing IP will be more widely used than HD analog in 2020. However, HD analog did fairly well, given how new it is, with 25% saying HD analog and IP would essentially be tied and 14% saying that HD analog would beat IP. Question: If there is existing coax cable infrastructure, would you upgrade to HD with IP or HD coax technology?